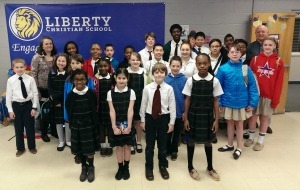 LCS students participate in many Association of Christian Schools International (ACSI) competitions during the school year. Select students travel to other participating schools to compete in events such as the Math Olympics, Spelling Bee, Leadership Conference and Chess Tournaments. Students also have the opportunity to submit poetry and short stories to the ACSI Creative Writing festival and to participate in a school-wide Speech Meet. Recently, one of our Middle School students traveled to Dallas, Texas to compete in the ACSI National Spelling Bee and our Chess Team traveled to Nashville, Tennessee to compete in an ACSI National Chess Tournament. Students have the opportunity to represent their school, both individually and as a team, and receive recognition and awards for their participation in these events.